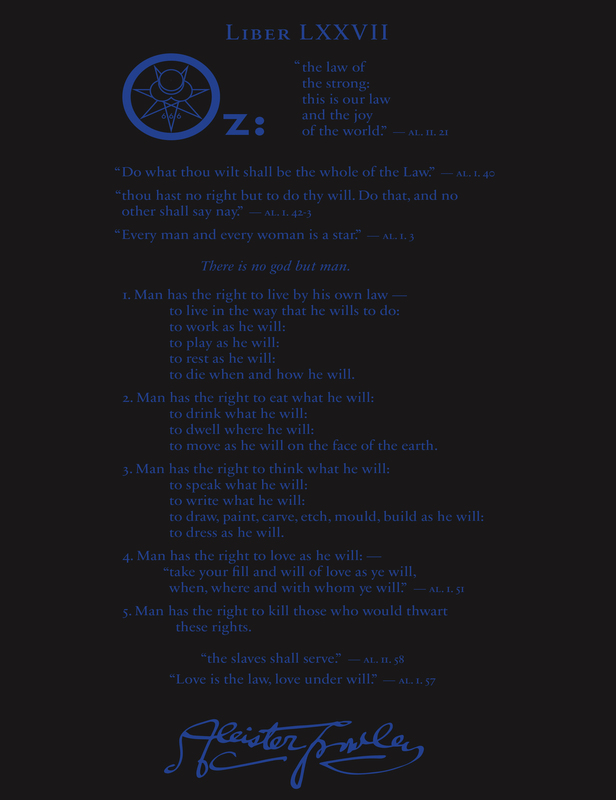 Welcome to the Liber OZ Project, a site dedicated solely to the promulgation of Liber LXXVII – a document regarding the “Rights of Man” written by Aleister Crowley in 1941. This single page proclamation has become a cornerstone of the Thelemic community and remains one of Crowley’s most enduring and influential pieces. It is our goal to provide a growing catalog of publications and translations of this seminal piece while sharing articles of interest related to the history and interpretation of this document. We are continuously expanding our on-line catalog as well the physical archives for which we have been entrusted. If you feel that you may aid us in translation, have an article you would like to submit, or may contribute to the expansion of our catalog – please do not hesitate to contact us. Enjoy your visit!